Breeding of fighting fish can be done in relatively small aquarium, whereby size of about 20 gallon is usually more than sufficient with the tank depth not more than 1 foot. The whole setup should be well-planted using different types of floating plants to shade the surface of the water and the top of the tank should be covered, preferably with a pane of glass to allow sunlight to penetrate through as well. 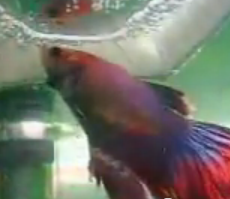 This is important so that incident of the betta fish jumping out of the water can be avoided as the breeding pair goes about with their mating activity. Furthermore with a cover, this can prevent excessive evaporation which can cause water temperature to drop drastically and this is actually bad for the fish. 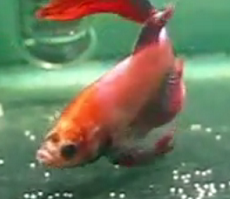 Do not worry about inadequate oxygen supply because fighting fish just like the other air-breathing betta species can directly rely on oxygen supply from the atmosphere without having those dissolved in the water. Overall, the perfect temperature in the breeding tank should be controlled at the range of 28 to 32 deg Celsius and maintained somewhere close around this region. Water movement in the aquarium should be minimized to avoid having strong current that can disrupt the spawning activity and cause the eggs to be swept away. Usually use of a box filter should be adequate and the air supply from the pump can be turned down to a very low level to create a mild flow effect. In order to induce breeding, make sure that the overall water quality is perfect with the slight greenish water appearance which is most suitable for the fish. This can be done by placing the aquarium close to a location whereby there is a brief exposure to morning sunlight but not directly towards it. For breeding purposes, only one mating pair can be housed in the same tank and never consider putting more than one just to save space. The male fish can be quite aggressive during the mating activity and will attentively follow the female to everywhere she swims and this can be quite strenuous to the betta fish. Thus, make all effort to study and select only the right female fighting fish which is truly ready to mate. Wrong selection can be disastrous because constant attention of the male fish to coax her to join the breeding activity when she is not interested can result in aggressive nature. Usually how you can tell whether the female fish is ready can be done by checking out whether there is a swollen girth (portion that contains the eggs) appearing close to the belly region and with close observation comparing against the other female fish, this should help you to make out the difference. The correct method in order to breed your betta fighting fish is to check out and test the willingness of the female fighting fish to mate. Before you put them together in the same aquarium, try to create a visible see-through aquarium partition so that the male and female are on each side of the tank separated from one another and during this period, observe the reaction of the pair. If the female becomes agitated upon seeing the male on the other side and will dash for cover upon seeing him, then this obviously signals her unwillingness to breed. On the other hand, if the fighting fish starts to change the pattern on her body to display a striking colorful yellowish appearance and starts to swim attentively towards the male, then this is a clear sign that she is now ready. From here, you should be able to tell whether your previous observation on the swollen girth which you used earlier is correct. From here, you can gain valuable experience in your next attempt to carry out breeding of your subsequent pairs of fighting fish. Never underestimate the effort done to create the partition for testing and brush it off as time consuming because the patience and decision of an aquarist can determine how successful the breeding program turns out to be. 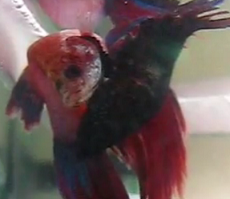 Wrong method can actually result in the death of the fish due to the aggression shown by the male betta fish and this is usually caused by injury or exhaustion that comes from the chasing and the worst case scenario would be the female fish jumping out from the tank due to extreme exhaustion and pressure. After 4 days, once all the eggs have hatched and the fry become free swimmers, both the parent fish should be removed from the tank. The fry will be scattered around swimming just beneath the water surface hiding among the floating aquatic plants in search of foods. During this period, finely crushed soaked baby fish powder should be fed to the young fry and in order to ensure that the foods are dispersed throughout the whole tank area, make sure you apply some form of aeration using air bubbles. After about one week, once they have gained more body mass with the ability to swim faster, you can consider using freshly hatched baby brine shrimp so that you can further accelerate and increase their growth rate. Because of the switchover of diet and with the increased amount of waste generated by the growing fry, any leftover food should be removed and water change should be done frequently to ensure that the water remains clean. Avoid using siphoning effect to remove the waste and instead use a bucket to scoop up the water so that you do not accidentally remove the young fry. If this routine is strictly followed, in no time, you should see your young betta fish achieving at least one inch in length in about a month. After another 3 to 4 months, you should be able to differentiate between the female and male fighting fish and the now adult brood should be sexually active to begin another breeding cycle.